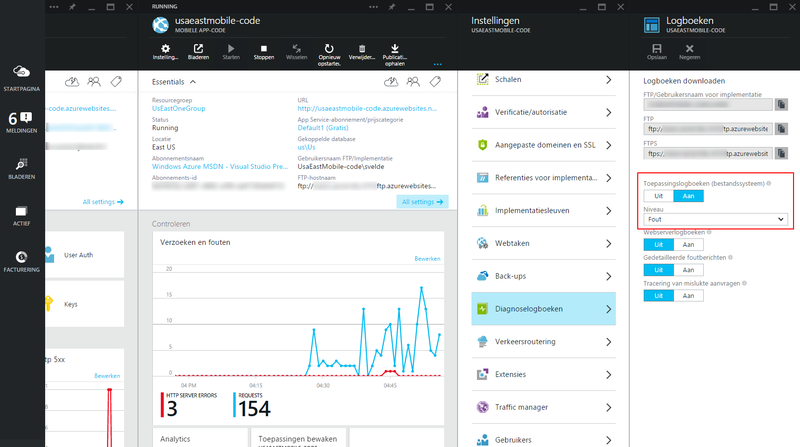 Where is my logging in Azure Mobile Apps? Microsoft has two solutions for mBaas at this moment. The first and already existing “mobile Backend as a Service” is Azure Mobile Services. 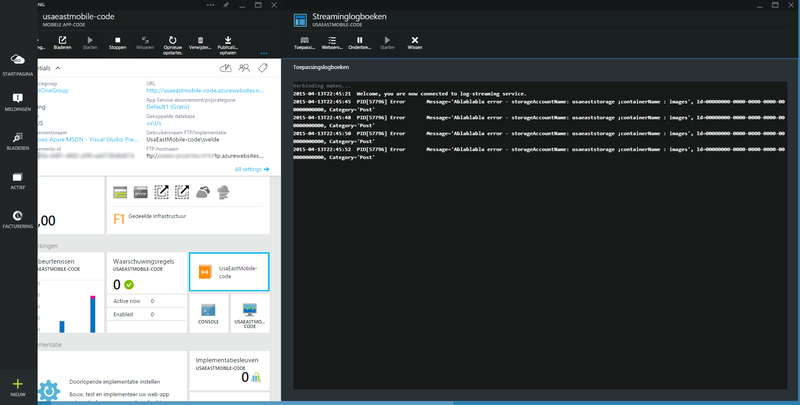 but a few weeks ago a new one arrived: Azure App Service. API Apps and Logic Apps are advertised as brand new. But Web apps should be nothing more then Azure Websites and Mobile apps should be an equivalent of Mobile Services. Although Azure App Service just arrived and it is still in preview (..) it is quite clear that things have changed. First of all it is recommended not to mix AMS specific Nuget packages with an App Service. For example adding the “Microsoft Azure Mobile Services .NET Backend Azure Storage Extension” to a Mobile App is not a good idea and will result in many conflicts. Just use the good old “Windows Azure Storage” package. Yes, it’s slow and filtering is missing but at least you know what happens on the server. And it’s great for a demo. It turns out you just have to activate it first. And this is not really cluttering your logging. The setting will be disabled after 12 hours automatically. So you can test or diagnose without any delay! One annoying thing is that changing the diagnostics level in the portal using the drowdown, does not active the save button at this moment! Seems to be a bug which is easy to fix. For now, before changing level, first disable and then re-enable the service. For more detailed information look here.